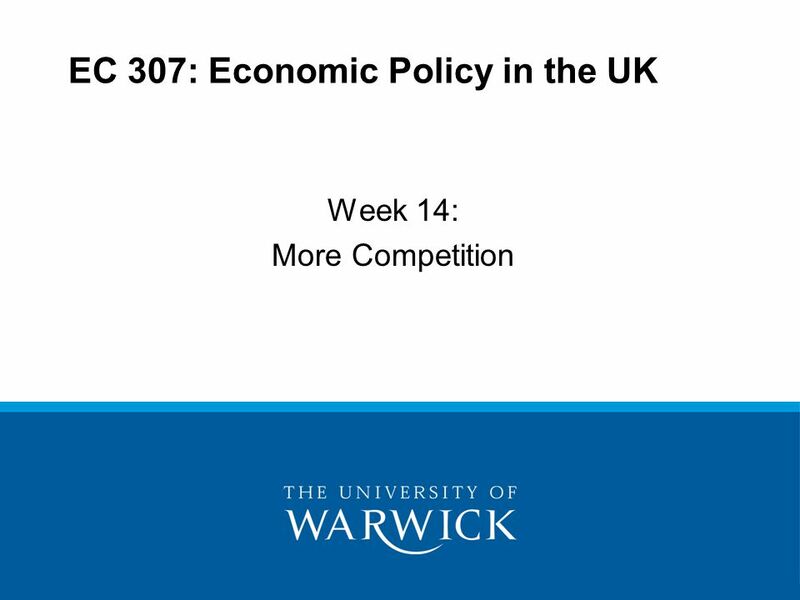 EC 307: Economic Policy in the UK Week 14: More Competition. 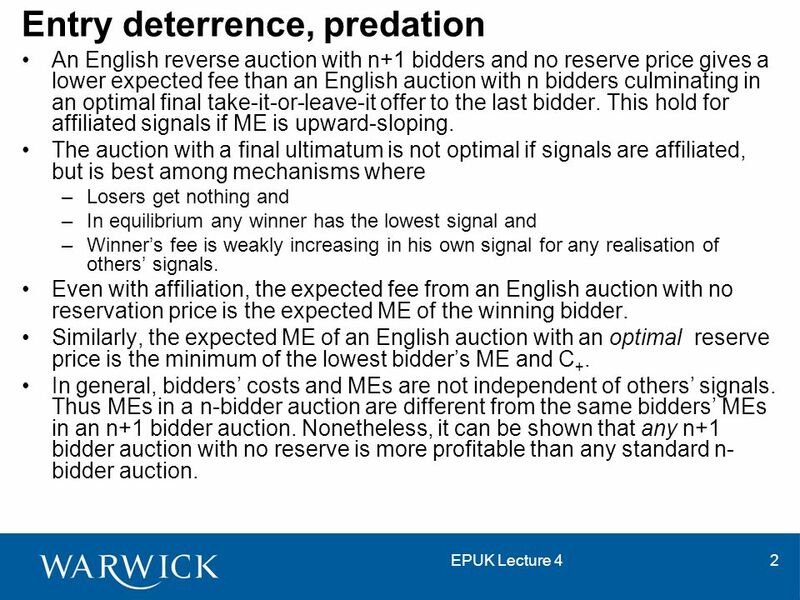 2 EPUK Lecture 42 Entry deterrence, predation An English reverse auction with n+1 bidders and no reserve price gives a lower expected fee than an English auction with n bidders culminating in an optimal final take-it-or-leave-it offer to the last bidder. This hold for affiliated signals if ME is upward-sloping. 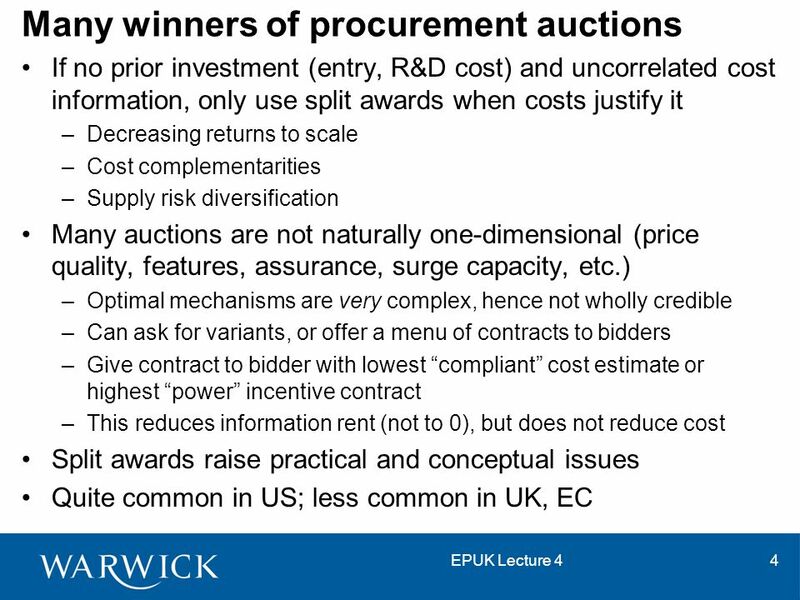 The auction with a final ultimatum is not optimal if signals are affiliated, but is best among mechanisms where –Losers get nothing and –In equilibrium any winner has the lowest signal and –Winner’s fee is weakly increasing in his own signal for any realisation of others’ signals. Even with affiliation, the expected fee from an English auction with no reservation price is the expected ME of the winning bidder. Similarly, the expected ME of an English auction with an optimal reserve price is the minimum of the lowest bidder’s ME and C +. 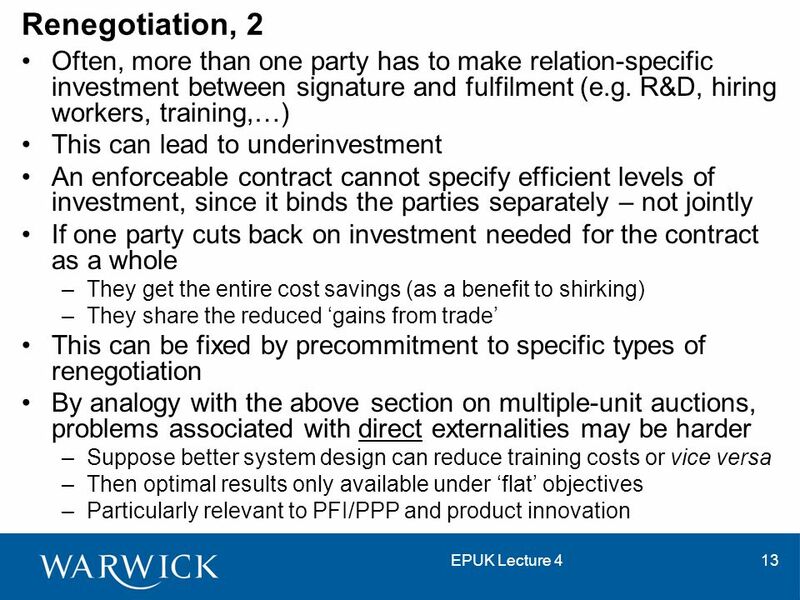 In general, bidders’ costs and MEs are not independent of others’ signals. Thus MEs in a n-bidder auction are different from the same bidders’ MEs in an n+1 bidder auction. Nonetheless, it can be shown that any n+1 bidder auction with no reserve is more profitable than any standard n- bidder auction. 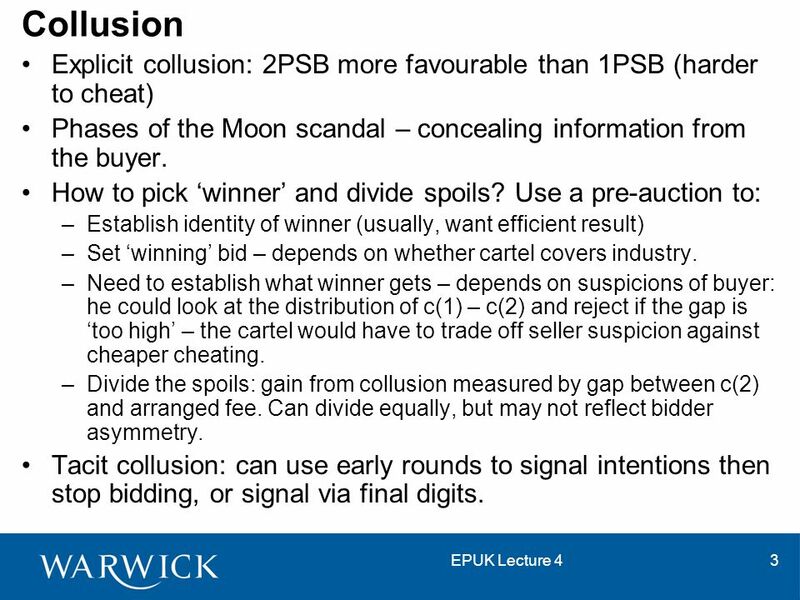 3 EPUK Lecture 43 Collusion Explicit collusion: 2PSB more favourable than 1PSB (harder to cheat) Phases of the Moon scandal – concealing information from the buyer. How to pick ‘winner’ and divide spoils? 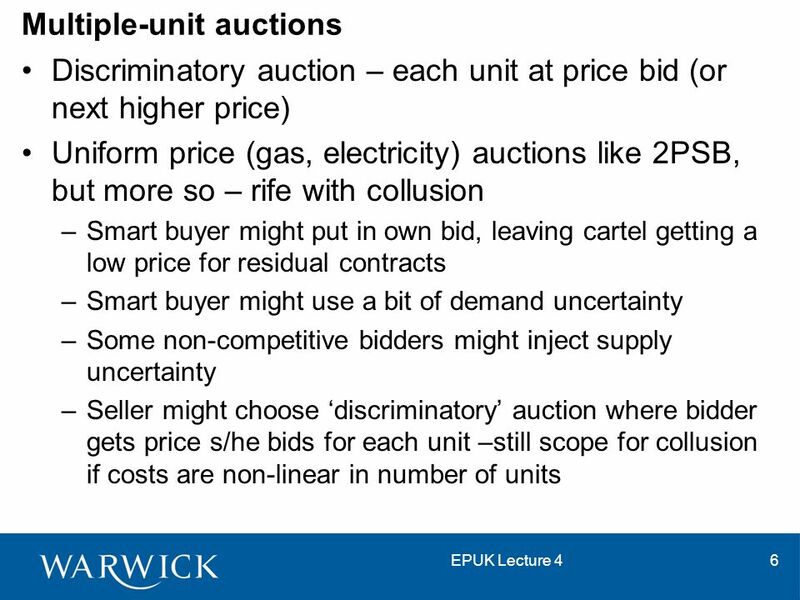 Use a pre-auction to: –Establish identity of winner (usually, want efficient result) –Set ‘winning’ bid – depends on whether cartel covers industry. 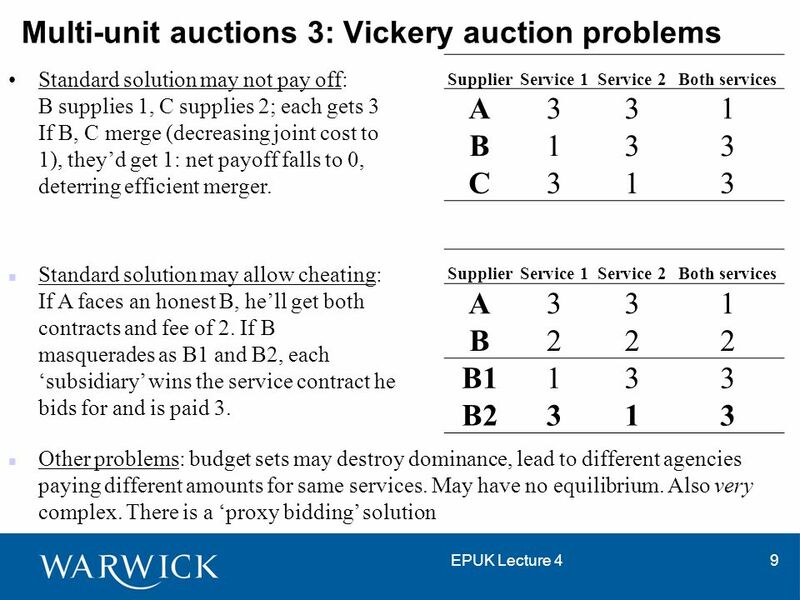 –Need to establish what winner gets – depends on suspicions of buyer: he could look at the distribution of c(1) – c(2) and reject if the gap is ‘too high’ – the cartel would have to trade off seller suspicion against cheaper cheating. –Divide the spoils: gain from collusion measured by gap between c(2) and arranged fee. Can divide equally, but may not reflect bidder asymmetry. Tacit collusion: can use early rounds to signal intentions then stop bidding, or signal via final digits. 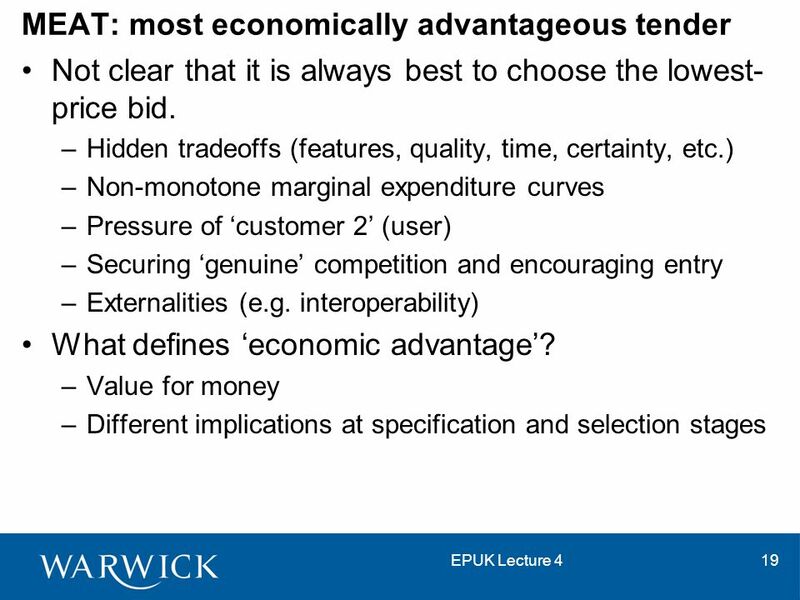 5 EPUK Lecture 45 Practical issues If firms have decreasing returns to scale (no externalities) and similar (common) costs, splitting is best; if firms are asymmetric, targeting is better If firms have increasing returns to scale results are similar (trade off cost (and administrative) advantages of a pooled award against risk of higher cost, hold-up) – probably there is less than optimal splitting, esp. in UK where scales are low. 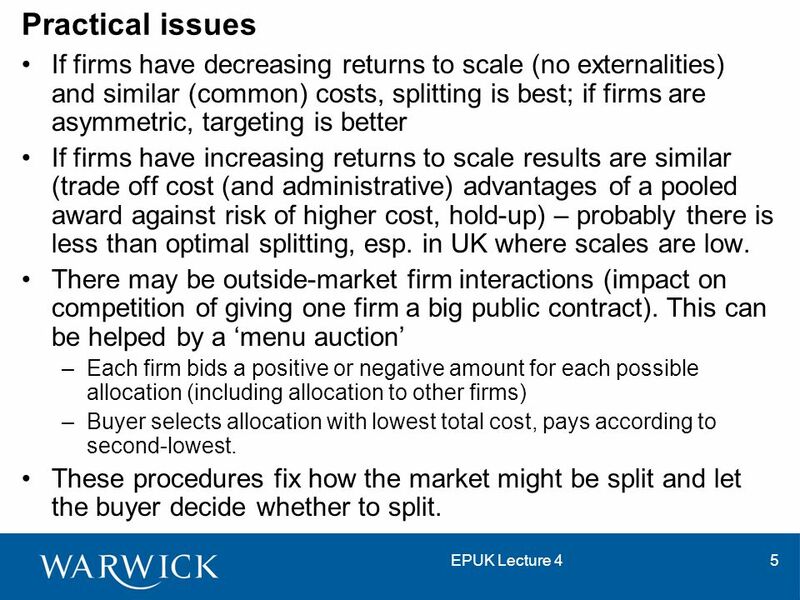 There may be outside-market firm interactions (impact on competition of giving one firm a big public contract). 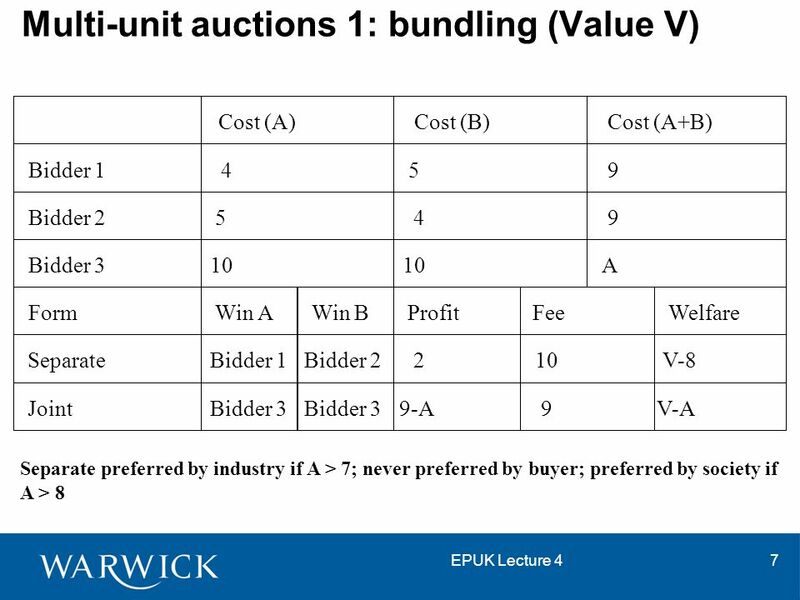 This can be helped by a ‘menu auction’ –Each firm bids a positive or negative amount for each possible allocation (including allocation to other firms) –Buyer selects allocation with lowest total cost, pays according to second-lowest. These procedures fix how the market might be split and let the buyer decide whether to split. 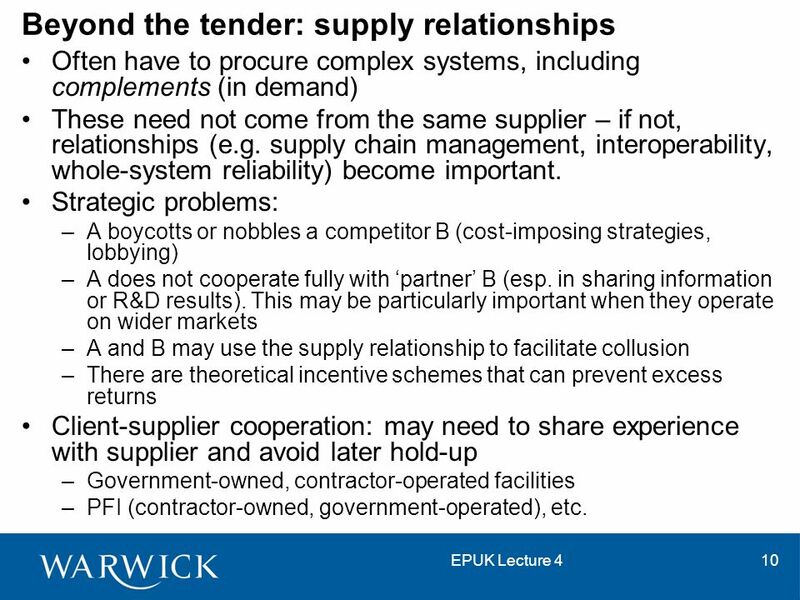 10 EPUK Lecture 410 Beyond the tender: supply relationships Often have to procure complex systems, including complements (in demand) These need not come from the same supplier – if not, relationships (e.g. supply chain management, interoperability, whole-system reliability) become important. Strategic problems: –A boycotts or nobbles a competitor B (cost-imposing strategies, lobbying) –A does not cooperate fully with ‘partner’ B (esp. in sharing information or R&D results). This may be particularly important when they operate on wider markets –A and B may use the supply relationship to facilitate collusion –There are theoretical incentive schemes that can prevent excess returns Client-supplier cooperation: may need to share experience with supplier and avoid later hold-up –Government-owned, contractor-operated facilities –PFI (contractor-owned, government-operated), etc. 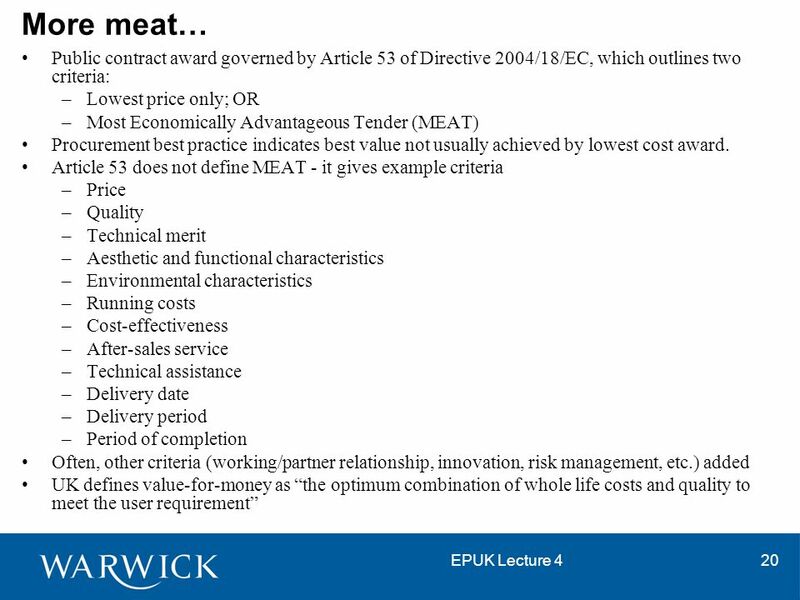 12 EPUK Lecture 412 Breach and renegotiation Any contract has conditions under which it has not been fulfilled Sometimes this is efficient (as when the original aim is unfeasible Contracts may specify penalty clauses –liquidated damages (money) –specific performance –Surety agencies Courts must enforce and interpret. 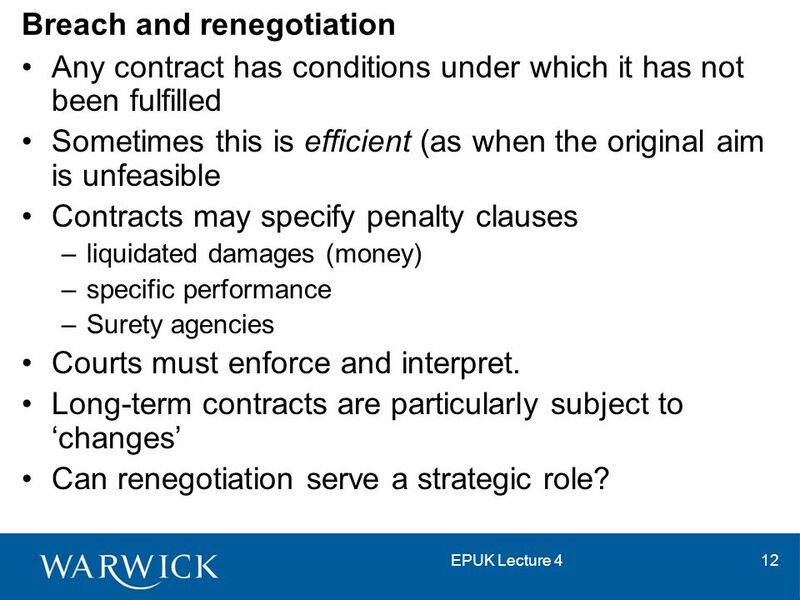 Long-term contracts are particularly subject to ‘changes’ Can renegotiation serve a strategic role? 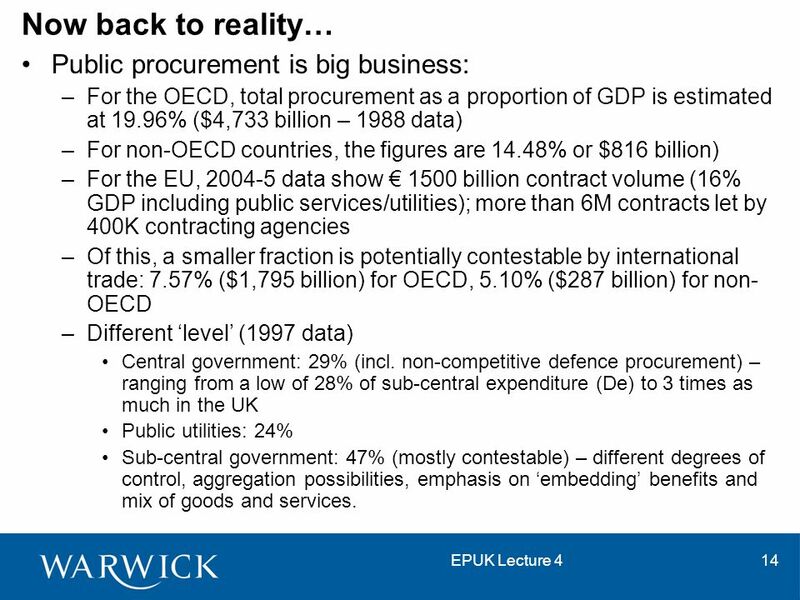 14 EPUK Lecture 414 Now back to reality… Public procurement is big business: –For the OECD, total procurement as a proportion of GDP is estimated at 19.96% ($4,733 billion – 1988 data) –For non-OECD countries, the figures are 14.48% or $816 billion) –For the EU, 2004-5 data show € 1500 billion contract volume (16% GDP including public services/utilities); more than 6M contracts let by 400K contracting agencies –Of this, a smaller fraction is potentially contestable by international trade: 7.57% ($1,795 billion) for OECD, 5.10% ($287 billion) for non- OECD –Different ‘level’ (1997 data) Central government: 29% (incl. non-competitive defence procurement) – ranging from a low of 28% of sub-central expenditure (De) to 3 times as much in the UK Public utilities: 24% Sub-central government: 47% (mostly contestable) – different degrees of control, aggregation possibilities, emphasis on ‘embedding’ benefits and mix of goods and services. 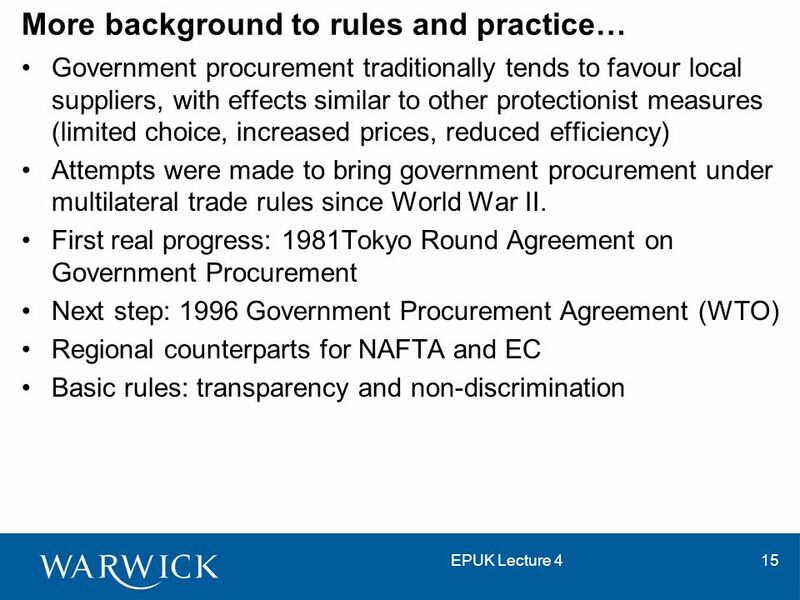 17 EPUK Lecture 417 EU legislation First directive on public procurement adopted in 1971 1990s: Need to review public procurement Directives – 3 different directives (goods, services and utilities). 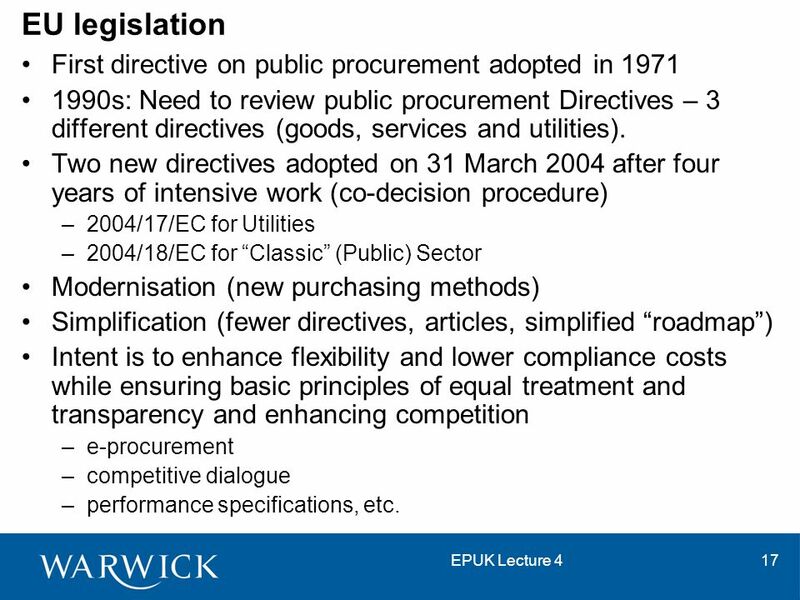 Two new directives adopted on 31 March 2004 after four years of intensive work (co-decision procedure) –2004/17/EC for Utilities –2004/18/EC for “Classic” (Public) Sector Modernisation (new purchasing methods) Simplification (fewer directives, articles, simplified “roadmap”) Intent is to enhance flexibility and lower compliance costs while ensuring basic principles of equal treatment and transparency and enhancing competition –e-procurement –competitive dialogue –performance specifications, etc. 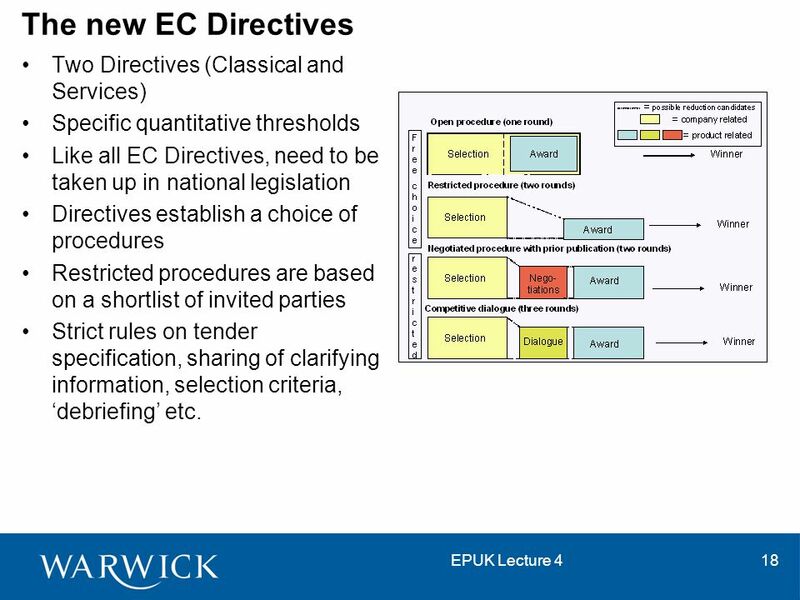 18 EPUK Lecture 418 The new EC Directives Two Directives (Classical and Services) Specific quantitative thresholds Like all EC Directives, need to be taken up in national legislation Directives establish a choice of procedures Restricted procedures are based on a shortlist of invited parties Strict rules on tender specification, sharing of clarifying information, selection criteria, ‘debriefing’ etc. 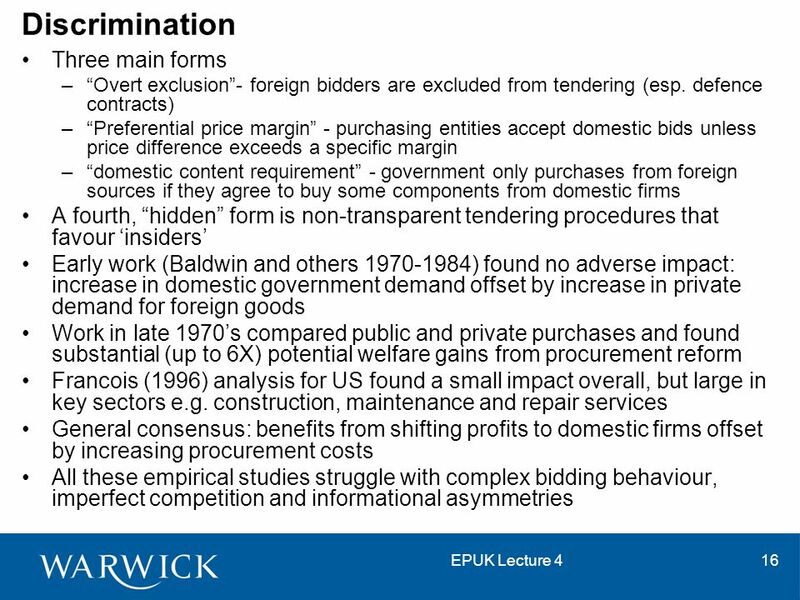 Download ppt "EC 307: Economic Policy in the UK Week 14: More Competition." Gender Perspectives in Introduction to Tariffs Gender Module #5 ITU Workshops on Sustainability in Telecommunication Through Gender & Social Equality. Relevant Procedures and approaches in PPI Relevant procurement procedures subject to the Public Procurement Directive 2014/24/EU Potential tender approaches. 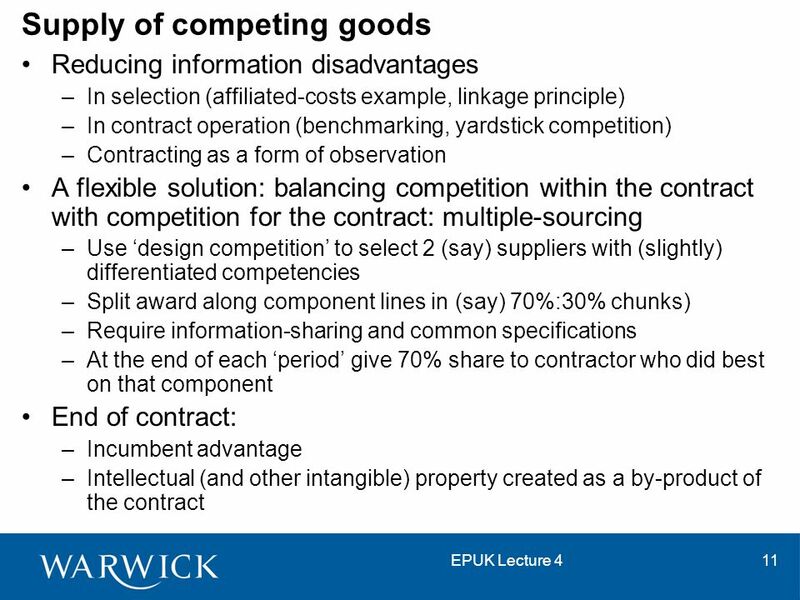 Competition Policy Vertical restraints – Interbrand Competition. TAMÁS NOVÁK International Economics IV. © OECD A joint initiative of the OECD and the European Union, principally financed by the EU PROCUREMENT PROCEDURES FOR THE AWARD OF CONCESSION/PPP CONTRACTS. © 2009 Pearson Education Canada 20/1 Chapter 20 Asymmetric Information and Market Behaviour. Simultaneous games with continuous strategies Suppose two players have to choose a number between 0 and 100. They can choose any real number (i.e. any. COMPETITIVE STRATEGY - Dolly Dhamodiwala. Chapter 7 In Between the Extremes: Imperfect Competition. 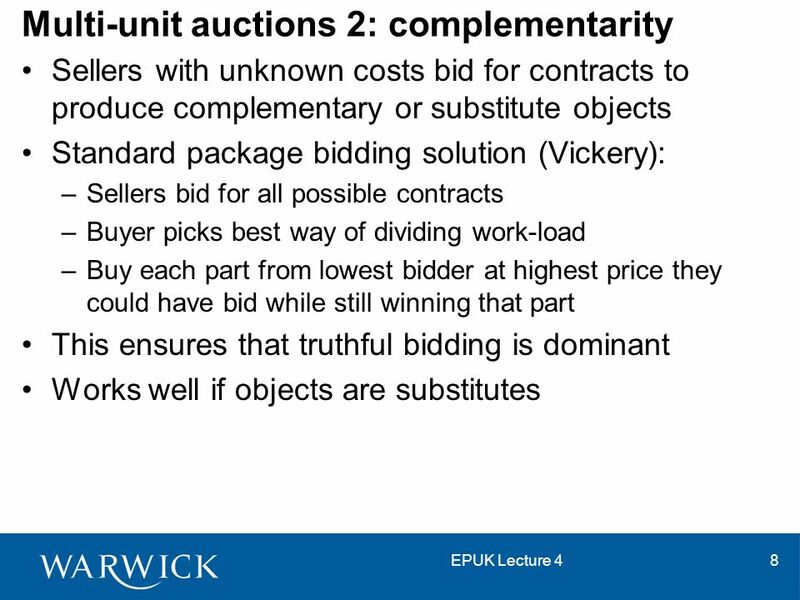 Lecture 4 on Auctions Multiunit Auctions We begin this lecture by comparing auctions with monopolies. We then discuss different pricing schemes for selling.